for about seven years and have helped many area youth find their confidence and success. 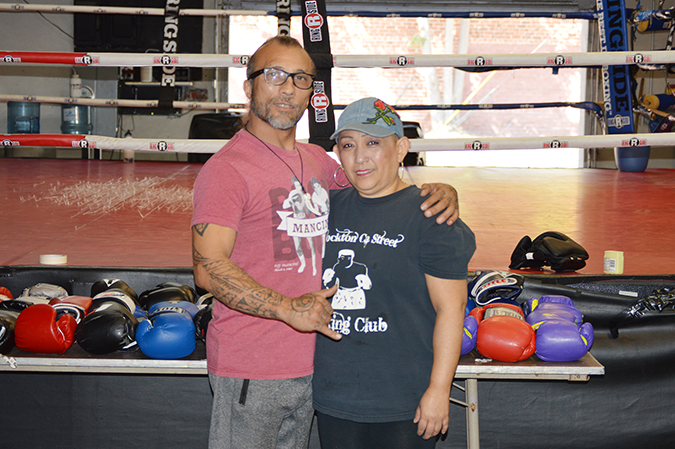 For Don and Jamie José, the Stockton Cal Street Boxing Club is more than just a business. It’s a way of life. Ever since they took over for the previous owners about seven years ago, their gym has become the biggest in Stockton and one of the most popular in the Central Valley. The formula for success appears to lie in the approach, for even though they are running a business, the real profit comes from shaping young minds. Whatever money they do make goes back into the gym, whether it’s equipment for someone who can’t afford it or, more often, to help with trips to bouts all over the country. Those excursions are also possible with fundraising help from the community as well as from the kids themselves. “It’s a struggle but it’s worth it,” says Don. “It’s a labor of love,” says Jamie. Yet it wouldn’t be possible without Don’s “high-school sweetheart” Jamie, who is herself a fighter. She just beat cancer and has been free of it for the past seven months. She gave him three sons, and of the two who made boxing a career, one became a professional and the other earned titles in both California and Nevada. They also balance each other out perfectly. She handles the paperwork, the logistical aspects, and deals with USA Boxing, which monitors the gym to make sure they adhere to the standards of a licensed facility. Meanwhile, Don can focus on coaching, and it’s something he’s sharpened over the past 25 of his 53 years. Born and raised in Stockton, his “stomping grounds,” he grew up in the mold of his father, a boxer for the Marine Corps who laced him up with gloves when he was just five. He died while Don was still young, but when he was nine he discovered a love for the sport and hasn’t looked back. He coached high school football for a while, but even then he was doing what he truly loves to do, and that is mentoring. “My whole life story has been to mentor,” he says. Don finds fulfillment teaching, saying that he wants to “give (the kids) a little bit of character, and teach them to stay focused in life no matter what (they) go through. While they’re here, I get on a personal level with them, not just boxing, but about school.” He frequently has these conversations while wrapping hands, something that must be done before the gloves go on. That motto seems to be getting through to the boxers because the gym can boast a bevy of talent: top ranked fighters, national and state champions, Golden Glove winners, and a slew of big victories all over the U.S.
For many, the Stockton Cal Street Boxing Club is a necessary sanctuary from the streets, and in addition to learning boxing it’s a place to meet peers, form lasting bonds, or just hang out, as long as they plan on hitting the bags at some point. Jamie and Don enjoy watching the kids grow up and become not only accomplished fighters, but good students and productive members of society. Still, all success hinges on the individual drive, something that Don is quick to mention. Stockton Cal Street Boxing Club is open from 2 p.m. to 6:30 p.m. Mondays through Fridays and is located at 317 N. California St. For more information call 507-5152.